What’s for breakfast? Lunch or dinner? 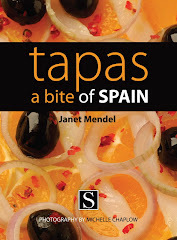 Tapas for a drinks party? Eggs! Eggs are the answer to any meal-planning dilemma. 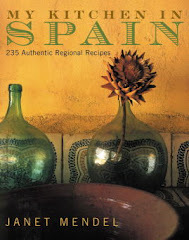 And Spain has you covered when it comes to really good ways to serve eggs. 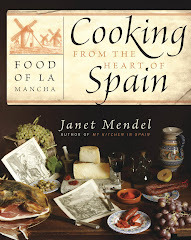 Think tortilla, the famous potato “omelet,” or fried egg atop a mound of vegetable pisto with zucchini and eggplant. 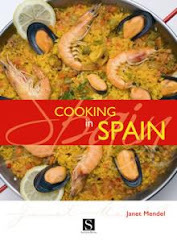 But of all the egg dishes, the one I go back to over and over is revuelto, eggs scrambled with vegetables, seafood or ham. It’s quick to prepare, much easier than the tricky tortilla. It can be scaled up or down—from a single serving to a family-sized brunch. It can be very homey or quite luxurious, depending on which ingredients you choose to incorporate. 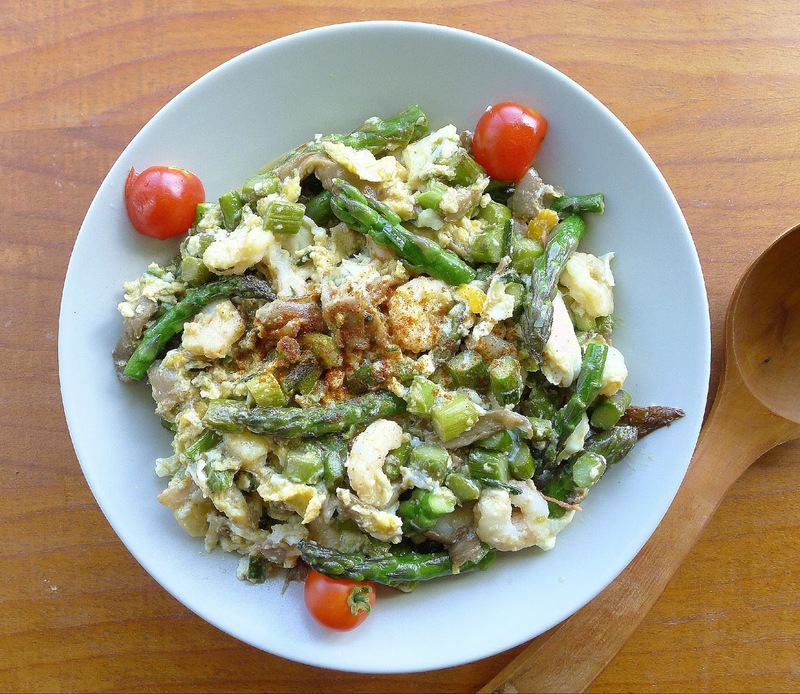 All scrambled up--eggs with asparagus, shrimp, mushrooms and garlic shoots. 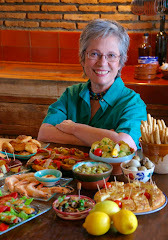 Fresh vegetables or leftovers, wild mushrooms or cultivated ones, a revuelto incorporates them all. Last week’s revuelto was leftover cooked broccoli with strips of serrano ham. 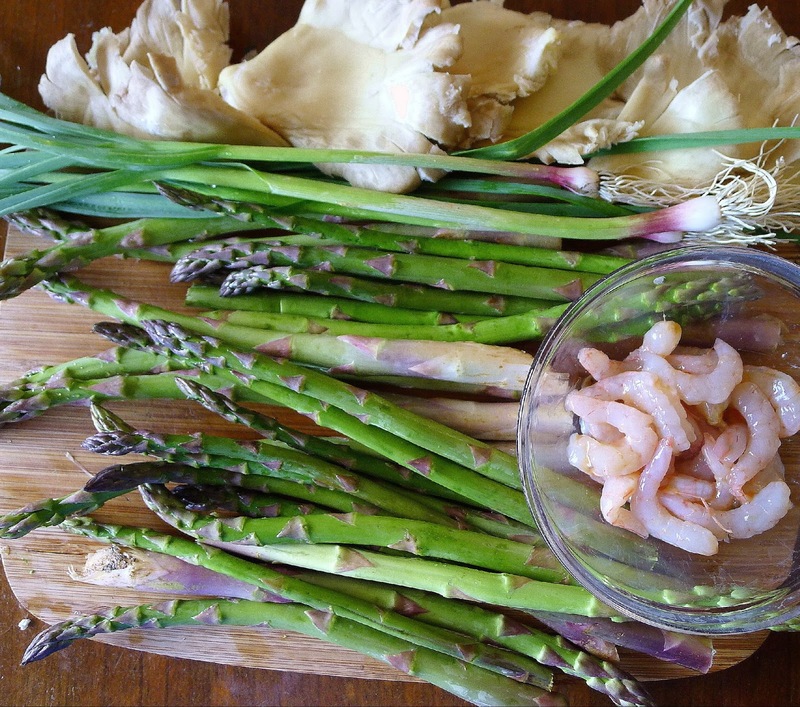 My revuelto this week is inspired by asparagus in the market and green garlic shoots in my garden. With the addition of mushrooms and small shrimp, it is a fairly substantial meal. Use any type of mushroom, wild or cultivated. Morels are divine; oyster mushrooms are fine. 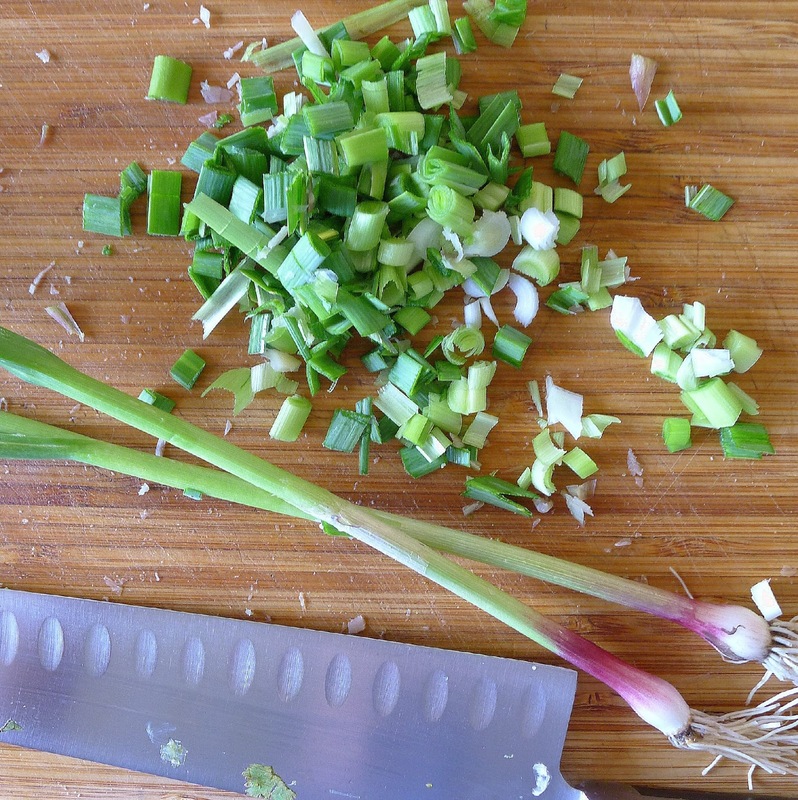 If green garlic shoots are not available, use 1 small clove of garlic with chopped green scallions. To serve revuelto as a tapa, spread it on toasts. Revuelto with five eggs makes three, four or five servings. Slice asparagus into small pieces; leave tips whole. Chop bulb, stem and leaves of green garlic shoots. Snap off and discard ends of asparagus. Slice the spears into ½ -inch pieces, leaving the tips whole. Clean and slice the mushrooms, discarding any hard stems. Chop the garlic shoots, including the greens. Heat the oil in a large skillet. Sauté the sliced asparagus on moderate heat 5 minutes. Add the asparagus tips, mushrooms and chopped garlic shoots. Sauté on moderate heat 5 minutes more, stirring frequently. Do not allow the ingredients to brown. Season with salt, pepper and red pepper flakes, if desired. Taste the asparagus. If it is done to your liking (crisp-tender), proceed to the next step. 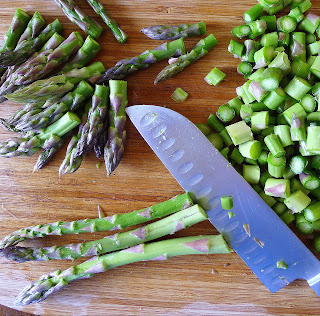 If you prefer the asparagus well-cooked, continue sautéing it another 4-5 minutes. The scramble! 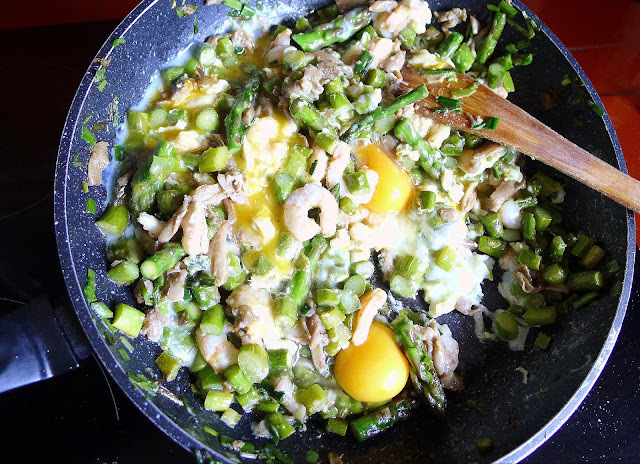 Break eggs into the sautéed vegetables and stir them around until set. Push the vegetables to the sides of the skillet. Lower the heat. Break the eggs, one by one, into the pan. Use a wooden paddle to scramble the eggs with the vegetables. Continue stirring until the eggs are set to your liking. 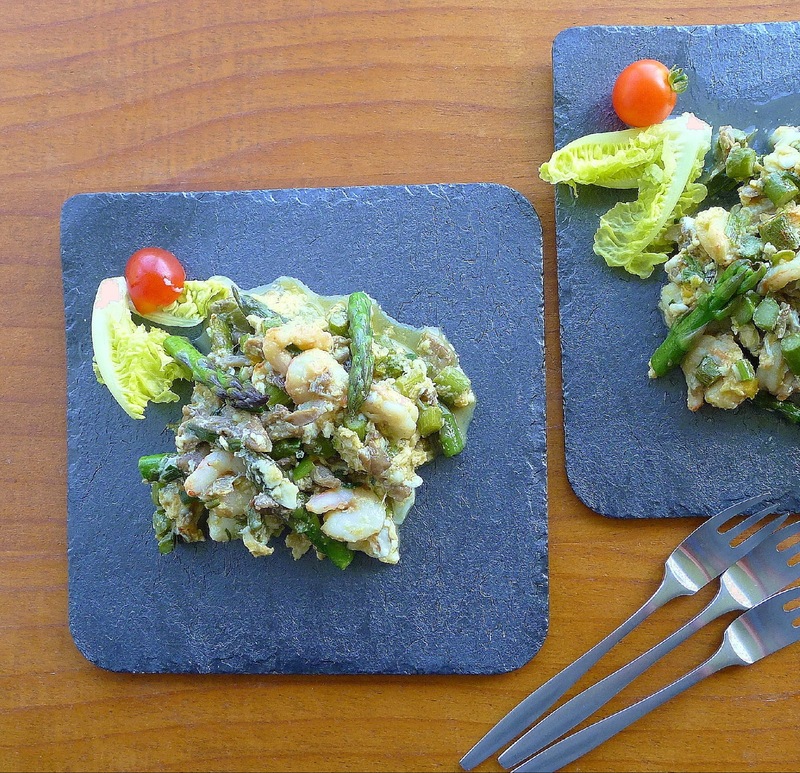 Place the scrambled eggs and vegetables in a serving bowl or onto individual plates. Sprinkle with pimentón. Serve hot accompanied by toast or fried bread, if desired. 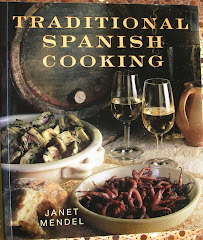 Here’s a nice coincidence—as I was writing up my recipe for revuelto, television chef, Enrique Sánchez on CanalSur, was making a similar revuelto, with asparagus, mushrooms and shrimp. His proportions were different—less asparagus and more eggs. And, he beat the eggs in a bowl before incorporating them with the asparagus. You can watch the 30-minute program (in Spanish) here. Eggs Scrambled with Mushrooms and Shrimp. 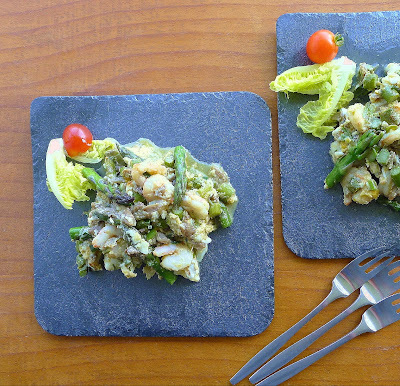 Eggs Scrambled with Wild Thistles (Tagarninas). Sauté of Asparagus and Fava Beans.